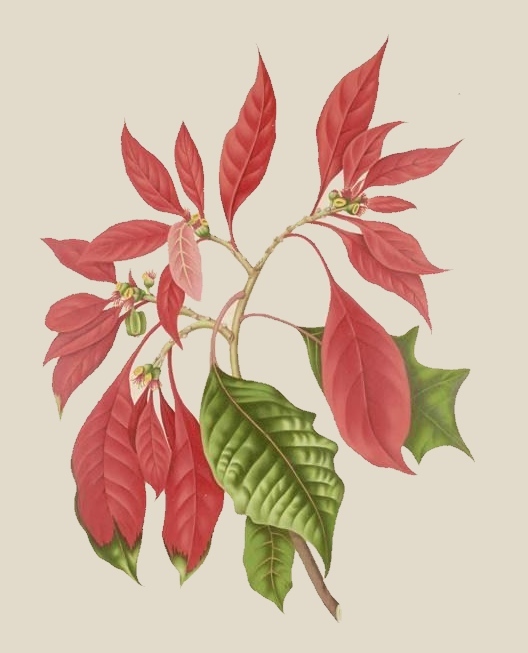 The poinsettia has so become associated with Christmas that I thought it belonged in both the vintage Christmas Images and Flower Illustration categories. There’s just something about these beautiful flowers that biologically aren’t really even flowers but brightly colored bracts. I love the way the artist C. Muquardt Bruxelles added green tips to the edges of the red leaves. Makes it so much prettier, don’t you think. I couldn’t find any information about the artist other than more examples of his work. I do know that this drawing was included in a work published in France in 1880. The work was entitled Fleurs, fruits et feuillages choisis de l’ille de Java :peints d’après nature or Flowers, fruits and foliages selected from the island of Java: painted after nature.